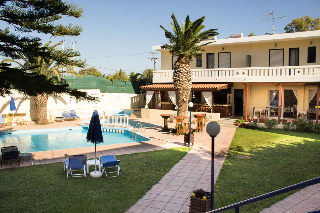 This property enjoys a convenient location in Rethymnon . There are a total of 36 rooms on the premises. The property is made up of 13 apartments and 23 studios. Set in the city centre, the Hotel offers easy access to the city and all it has to offer. Guests can easily walk to the main bus and train stations. The Hotel is within a few minutes' drive from public transport links. The Hotel is just a short walk from the city's main entertainment areas. Golf lovers will be pleased to find the nearest golf course closeby. The beach is only a few metres away from the Hotel. The property is within walking distance from the harbour. There is an on-site car park. This establishment allows pets.